The promising rejuvenation of Doctor Who in Season Ten continues with Frank Cottrell-Boyce’s “Smile.” It is far from a perfect episode, but it’s a great deal of fun, and leaps and bounds ahead of the writer’s previous effort, “In the Forest of the Night,” which was one of the (all-too frequent) nadirs of Season Eight. As I predicted last week, the callbacks to the final seasons of Classic Who continue as well. In “Smile,” Old School Woovians will no doubt hear deliberate echoes of 1988’s “The Happiness Patrol,” in which the Seventh Doctor and Ace visit a future dystopia in which unhappiness is a crime punishable by death. The similarities, admittedly, are slight: “The Happiness Patrol” was a vicious (if uneven) satire of Thatcher’s England, while “Smile”—a few digs at “the utopia of vacuous teens” aside—has nothing quite so political or satirical on its mind. Still, it’s hard to shake the feeling that Moffat’s template for Twelve and Bill is largely—and, to my mind, delightfully—based on Seven and Ace. There is no security, against the ultimate development of mechanical consciousness, in the fact of machines possessing little consciousness now. A mollusk has not much consciousness. Reflect upon the extraordinary advance which machines have made during the last few hundred years, and note how slowly the animal and vegetable kingdoms are advancing. The more highly organized machines are creatures not so much of yesterday, as of the last five minutes, so to speak, in comparison with past time. Assume for the sake of argument that conscious beings have existed for some twenty million years: see what strides machines have made in the last thousand! May not the world last twenty million years longer? If so, what will they not in the end become? Is it not safer to nip the mischief in the bud and to forbid them further progress? So Butler’s fear that machines could evolve to achieve consciousness—a very different, potentially dangerous consciousness—is clearly one of the central ideas of “Smile.” The colonists believe they have “cracked the secret of human happiness” through the Vardi, service robots designed to monitor and maintain joy. But the Doctor invokes the story of a magic haddock—a be-careful-what-you-wish-for parable—and explains that “magic haddock, like robots, don’t think like people.” When a natural death sets off a “tsunami of grief” throughout the colony, the Vardi begin trying to enforce universal happiness with lethal force. Lose your happy thoughts, and you wind up as compost. Missing, too, is any real resonance about what this all means. It feels like there were opportunities here to explore the fact that sadness and grief are necessary emotions, and to reinforce the Doctor’s assertion that “granting all your wishes is not a good idea.” (Perhaps a better resolution to this story would have been if the newly self-aware Vardi—faced with the destruction of their brothers—came to understand death and grief.) Cottrell-Boyce never fully develops his promising scenario, or sticks the thematic landing: the result, though fun, ends up feeling smaller than the sum of its parts. But, in Doctor Who, quibbles about the plot are never that important. “Smile” otherwise does everything it needed to do, particularly as new companion Bill’s first real outing with the Doctor. Last week I discussed how quickly Bill zeroed in on the Doctor’s true character, with her observation that he “hides” himself in a big box of doors that say “Pull to Open.” This week, however, she really gets to know him. (Hiding in plain sight seems to be a theme of this season so far. Last week, Bill complained that her face always makes expressions when she’s trying to be enigmatic: here, the Emoji badges make it literally impossible for her or the Doctor to be enigmatic. Everything’s out in the open, which is a clever idea for the getting-to-know-you episode.) 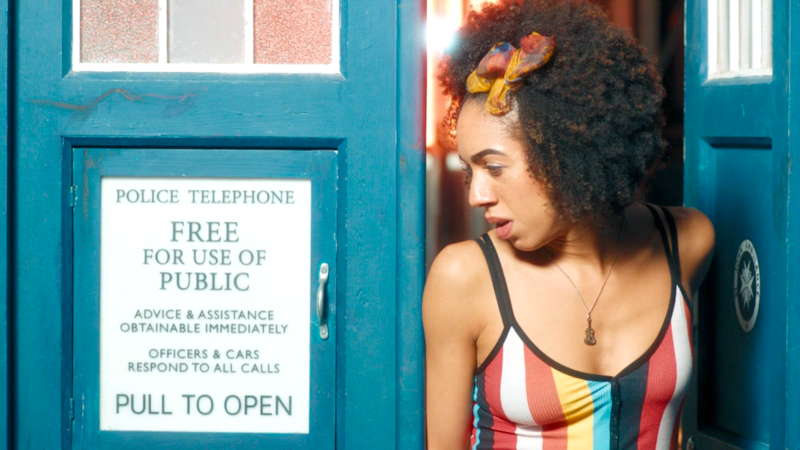 And Bill takes a closer look at that sign on the TARDIS exterior, and starts to grasp what traveling with the Doctor really means. “Advice and Assistance Obtainable Immediately,” the sign says, and she realizes—as she says a little later—that the Doctor is the helpline. Which means, of course, that so is she. 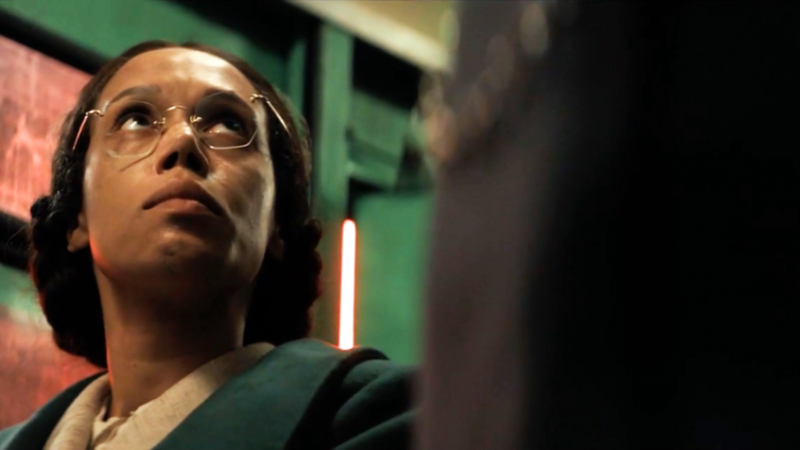 This is the important next step for one of the Doctor’s companions, the moment when they grasp that traveling in the TARDIS isn’t all fun and games. 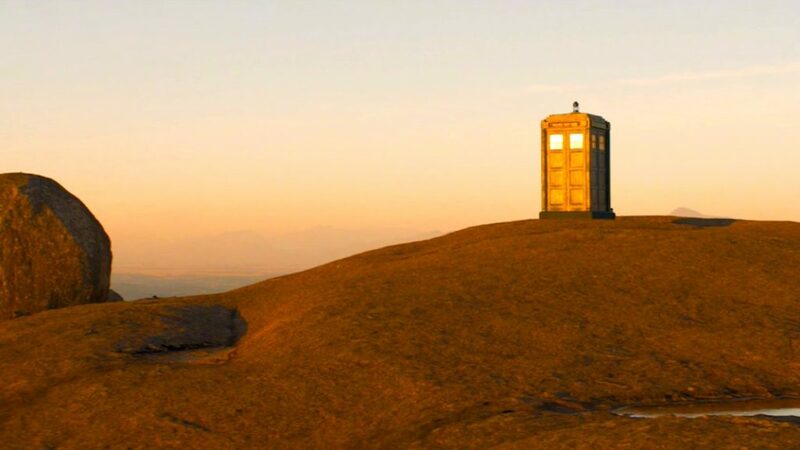 Each companion has that moment—usually, as here, in their second adventure—when they have to make a conscious choice to accept the risks and responsibilities. 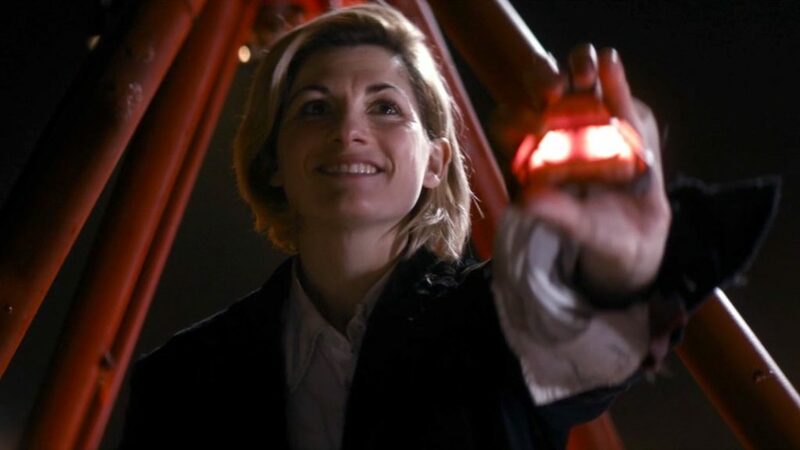 (“You’ve seen how dangerous it is,” the Ninth Doctor says to Rose at the end of “The End of the World.” “Do you want to go home?”) Every companion—Martha in “The Shakespeare Code,” Donna in “The Fires of Pompeii,” Amy in “The Beast Below,” Clara in “The Rings of Akhaten,” begins their second episode as a tourist, and ends as a hero. By the end of the episode, Bill is a full companion, with all the privileges and responsibilities that entails. “Did you—did we—just jumpstart a new civilization?” she asks him, her corrected plural pronoun indicating that she’s made the transition and accepted the role. “It’s a dirty job, but someone’s got to do it,” he replies casually, echoing the “What the hell?” spirit of last week’s episode. What I’m loving about this season so far is the lightness with which all of these old, serious themes are treated. 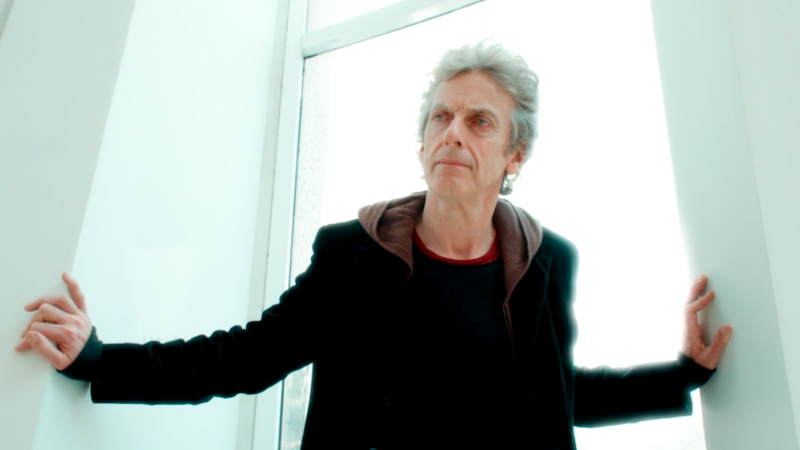 My chief complaint about Capaldi’s first two seasons was that Moffat seemed unwilling to leave behind his navel-gazing explorations of the Doctor’s soul. “Am I a good man?” the Twelfth Doctor asked Clara in his first episode, “Deep Breath,” and kept asking, in one form or another. It’s a worthy question, but—as I’ve written before—it’s a question Moffat answered ad nauseam throughout Seasons Five, Six, and Seven, culminating in the very satisfying answer of “The Day of the Doctor.” I had hoped that—with a clean slate, and a newly cleaned conscience—Capaldi’s Doctor would just get on with being a good man, like the Doctors of old had done. Which, finally, seems to be what is happening here. Bill continues to tease out the nature of the Doctor, and challenge him on some of his assumptions, but that’s just as it should be. 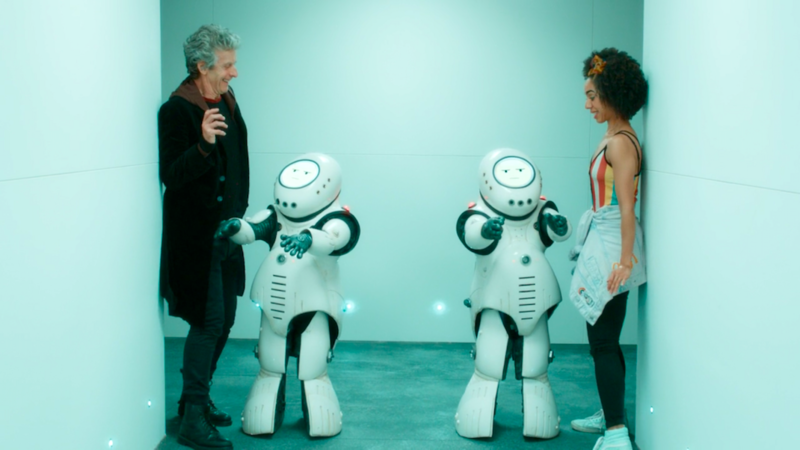 Moffat and Company continue to come up with clever ways to metaphorize the Doctor/Companion relationship—the memory wipe of the robots here calls back to last week, which called back to Donna and Clara—but it’s subtle, and unobtrusive. “Smile”—like “The Pilot”—is not a story about the nature of the Doctor: there are ethical dilemmas and difficult choices, but—rare for New Who—their exploration is neither maudlin nor histrionic. Without ever neglecting character—both the Doctor and Bill are written delightfully here—Moffat, in his final season, seems to have finally turned the show’s (and our) attention outward, not inward, and that is very welcome. We’re just getting on with telling good stories: fun, exciting stories, about big ideas. That, ultimately, is exactly what I want Doctor Who to do. Though not quite rising to the level of the Adipose—the gold standard of adorable menace in New Who—the Vardi are really kind of cute.